The figure used for this unit is a modified Heroclix figure from the TMNT Heroes in a Half-Shell set. Its model number and name are #006 / Foot Ninja (Katar). Character Bio - Reptile is a green garbed, humanoid reptilian creature that embodies the archetype of the unhappy underling. Said to be physically hideous and repulsive, he is renowned for his great stealth and unquestioning loyalty. Unlike many other henchmen, Reptile does not strive for power. He is caught in a delusional state of mind, obsessed with finding the last remaining member of his race, or freeing his homeworld of Zaterra from Outworld's grasp. Thus, he always remains loyal to Shao Kahn, only obeying other masters to survive and reach his goal of returning Zaterra to its former glory. While well-meaning and sincere, his obsession is so important to him that it causes him temporary fits of insanity. 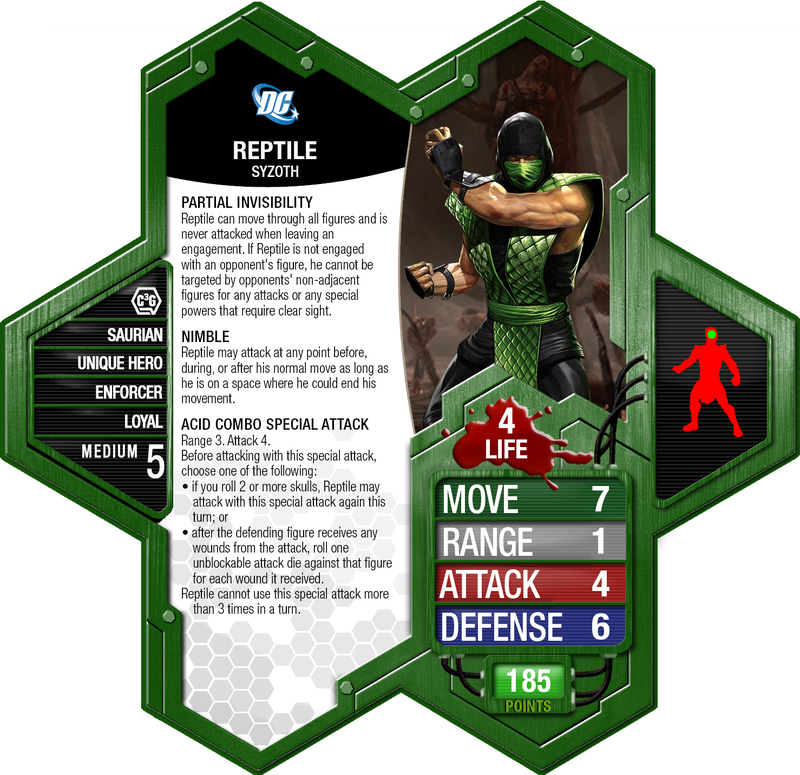 As a figure with a secret identity, Reptile has these Secret Identity Synergies. As a figure with a secret identity, Reptile interacts differently with these special powers. As a figure with a special attack, Reptile can interact differently with these special powers. Reptile was created by Ed Boon and John Tobias. Last edited by Arkham; March 16th, 2019 at 05:58 PM. Reptile can move through all figures and is never attacked when leaving an engagement. 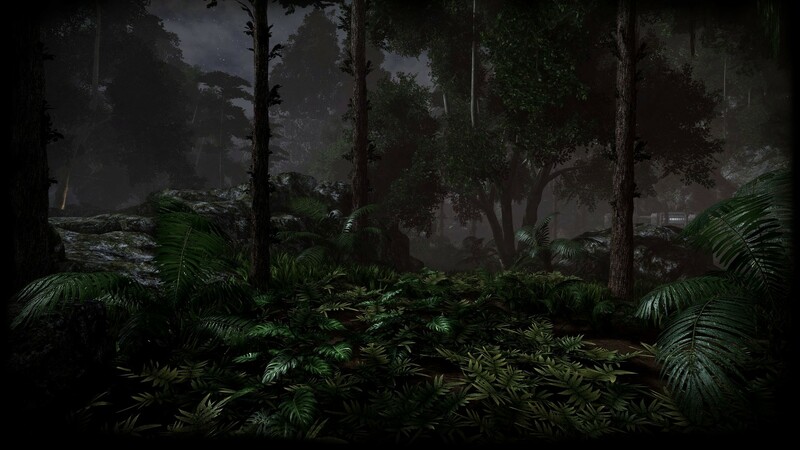 If Reptile is not engaged with an opponent's figure, he cannot be targeted by opponents' non-adjacent figures for any attacks or any special powers that require clear sight. Reptile may attack at any point before, during, or after his normal move as long as he is on a space where he could end his movement. • after the defending figure receives any wounds from the attack, roll one unblockable attack die against that figure for each wound it received. Reptile cannot use this special attack more than 3 times in a turn. Reptile may attack at any point, before, during, or after his normal move as long as he is on a space where he could end his movement. After attacking with a normal attack, if Reptile rolled 2 or more skulls, Reptile may attack again this turn. Reptile cannot attack more than 3 times in a turn. If Reptile inflicts 1 or more wounds on a figure with this special attack, roll 1 unblockable attack die against the chosen figure for each wound inflicted in that attack. Last edited by Arkham; May 18th, 2018 at 08:10 PM. You will need the Foot Ninja (Katar) Heroclix from the TMNT Heroes in a Half Shell set. 1. Clip off the weapons using fingernail clippers(easiest) or an exacto knife. 2. Next, paint the green uniform as detailed in the pictures. 3. Paint the black parts of the under uniform and the pants. 4. Paint the skin a different, spongier green than the green you used for the outfit. 5. White for the eyes and then a dot of orangish. Last edited by Arkham; March 7th, 2019 at 09:52 PM. He's looking pretty good. I do like the 4 life/6 def/partial invisibility combo, it should give him a chance to engage and dish out some damage while not making him feel impossible to take down. I'm on board with the SA being base 4 attack, with the default def. rating being 5-6 these days 3 att. is just too weak, but I'm a little lost on the theme of the extra damage. Watching the combo videos you posted before, I never got the impression the acid spit was all that damaging. It seems more like poke damage he can dish out at range, used to soften then up before he engages to dish out the real damage. Also just a general comment on acid, I often think of acid corrosion as something that weakens and destroys metals (ie. armor plating) and thus leaving the target less protected from a later attack. I wonder if we could somehow incoporate those ideas into something here. Instead of extra damage, lower defense, either as part of the initial acid attack or as part of a following attack. If the second option, then maybe incorporate it into the 3 hit combo, where you can use the Acid SA as the first attack, then the second & 3rd attacks are normal attacks vs. lower def. Reptile may attack at any point, before, during, or after his normal move as long as he is on a space where he could end his movement. After attacking with a normal or special attack, if Reptile rolled 2 or more skulls, Reptile may attack again with a normal attack this turn. Reptile cannot attack more than 3 times in a turn. If Reptile inflicts 1 or more wounds on a figure with this special attack, instead of placing wound markers, for the rest of Reptile's turn you may have that figure roll 2 fewer defense die. Something along those lines, is the -2 def. on potentially 2 following normal attacks be enough of a lure to give up an inflicted W? I'm not sure, but I like the image generated in my head of him spitting acid on a Counter Strike figure, lowering their defense by 2, then moving in and punching that figure twice without worrying as much about the defense power coming into play. I think we are trying to avoid defense reduction mechanics being over used on the MK fighters, and just save them for the most appropriate. I feel like acid mechanically should have similar effects to fire, so I don't see an issue with it in its current state. Also, the 3-Hit Attack is most interesting due to the gamble nature it currently has, forcing you to choose when to use the Acid Spit. Adding to the feel of a combo. With your proposed version, that gamble no longer exists. I'm still pretty happy with this. 4 Range seems kind of far for some spit, and I actually like 3-Hit Combo better than 3-Hit Attack (which just sounds generic to my ear). But mechanically I'm good with him. I'll put a reminder now that we like tutorials for our customized figures, though, so be sure to keep that in mind. I'm fine with making it a range of 3 to stay in-line with his base range of 3. Name can be just about anything, as long as it sounds cool, I'm not too picky about what we end up with. I did a tutorial for Sub, so I'll just modify it for Reptile. No issue there. Mechanically, I think I'd like him better with a range of 1, but what's thematic is thematic. I think with range and Partial Invis, he's gonna be attacking at range from height a lot of the time, so he's gonna be rolling at 5+ dice and just getting 2 skulls isn't too much of an ask. I could see the requirement for the multi-attack maybe needing to come up to 3 skulls. We'll see how it plays, though. Looking good here! Thanks for being willing to tweak the dials on him. I think it'll make for a better, more well liked design. I've seen 1 skull come up on 5 plenty - perhaps not a massive risk, but still a significant one. Cool design - nice to see MK make it in finally! I've seen zero skulls come up on 10 dice before we still price Hulk on the statistical odds. He fits nicely with Star-Lord or Cap or both and triple 7's from high ground will be brutal. What about changing 3 Hit Combo into a SA with Range 3 and making normal attack Range 1?